In this latest installment of the #IamPaxChristi interview, we’re profiling Wiltrud Rösch-Metzler, former member of the International Board of Pax Christi International. She is from Germany and has served as the national chair of Pax Christi Germany. This series aims to highlight short conversations with the women and men who make up our movement. The interview was conducted by communications intern Marie Just earlier this year. Marie Just: How did you become involved with peace and justice work, and what was your first involvement in Pax Christi International?? Wiltrud Rösch-Metzler: I think international justice is a central theme to my life. This initially started to connect with the ecclesiastical youth work that I was involved in; it got me interested and engaged with what we call ‘one-world-topics’ today, or at the time the ‘North-South conflict’. That is why I went to study politics. And it is also the reason for my strong affiliation with justice. Then there was also the topic of stationing missiles in Germany in the 1980s — American nuclear missiles were stationed in West Germany and corresponding to that the armament took place on the Soviet side too, and we have demonstrated against that, we called for the disarmament of atomic rockets. That was then the first time I marched for peace, and the time that I joined Pax Christi: we founded a local Pax Christi group in Metzingen. MJ: During your time at Pax Christi Deutschland, can you recall a moment in which the work of Pax Christi Deutschland made a real difference in the situation of your country, or in the lives of the people living there? WRM: There were never short-term moments, but rather long-term processes. This means that you need to have a lot of patience. And that you have to stay focused on the message of peace, and in carrying that out. One example is the work we do in the Middle East, and therein the example of the work on the violent Israeli settlements. Pax Christi supports a two-state solution, as in accordance with international arbitration within that particular peace process. To make this two-state solution possible for the Palestinians – hence in order to be able to create a Palestinian state – its territory needs to be freely available. However, in the current situation, the Palestinian state area (i.e. the West Bank, East Jerusalem and the Gaza Strip) is subjected to (new) Israeli settlements being built in the West Bank and East Jerusalem. And it doesn’t stop here, there is also the land which is claimed by Israel – the occupying power. This means that this land will be taken from what would potentially be Palestinian State territory. Furthermore, the settlements violate international law, for, according to the law, no occupying power can transfer its own population to Occupied Territories. International law also obliges other states, e.g. Germany, not to support a breach of international law. So we think that if we do not label settlement products – i.e. we do not distinguish between Israeli goods that originate from Israeli territory or from the Israeli settlements – we do not know for sure whether we are taking part in a breach of international law. Yet consumers who do not want to purchase goods coming from these settlements, have a really hard time distinguishing one from the other. That is why the Pax Christi Middle East Commission in Germany launched the campaign “Besatzung schmeckt bitter” (i.e. “Occupation tastes bitter”), which demands an obligated labeling of settlement products. To this end also, the EU decided two years ago that settlement products must be labeled and that they have no tax exemption – like any other product coming from Israel. This was a big and important step towards the right direction, but we still cannot speak of a genuine breakthrough, since – also in Germany – this decision has not been put into effect yet. I still haven’t seen any signs in any supermarket that indicate a certain product being imported from the Israeli settlements. The campaign “Besatzung schmeckt bitter” has been running since 2012 and is ongoing. WRM: Nonviolence is a political concept that allows civilians to get involved in resolving conflicts, but in which they do not run the risk of getting injured and which provides a fairly just balance between the parties. MJ: How many years have you been part of Pax Christi Deutschland? WRM: Since ’81, so 35 years. MJ: What other roles have you had within Pax Christi International? 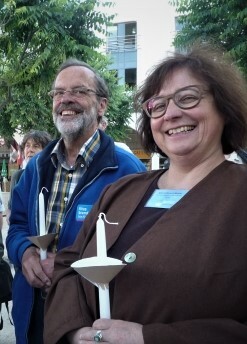 WRM: For seven years now, I am the chair of Pax Christi Deutschland. Before that I was, for nine years, the spokesperson of the Middle East Commission of Pax Christi. I have also been a member of the international board of Pax Christi for six years (two terms) – which came to an end this year. Only through the efforts and vision of women, may peace have a chance.